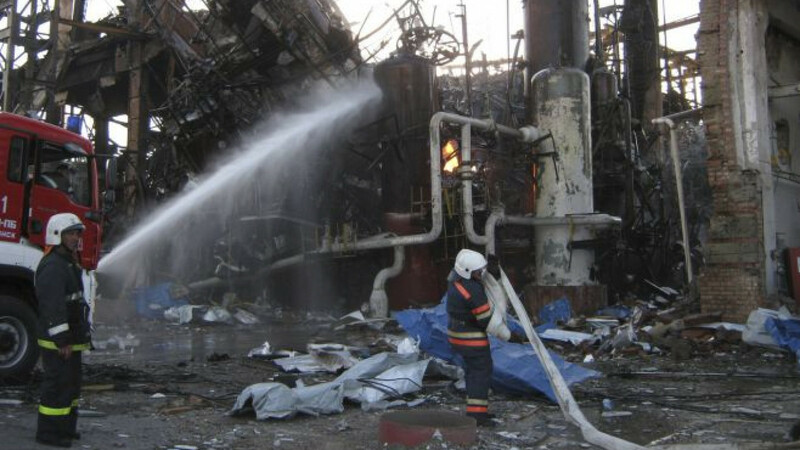 Six people were killed Sunday in a fire at at Russia's Rosneft Achinsk oil refinery in Siberia. Russia's top oil producer Rosneft has halted production at its east Siberian Achinsk refinery after a fire killed at least seven people, industry sources said on Monday. One source said the repairs could take up to six months. Rosneft said the fire had broken out on Sunday evening at a fractionation unit of the refinery, which normally produces 140,000 barrels per day of oil products, causing fatalities and injuries. An Emergencies Ministry official said Tuesday seven people had died, seven were injured and two others were missing. Industry sources said the fractionation plant was badly damaged and other units were also affected. "Without this unit, the production process is impossible," a source said. A Rosneft spokesman declined any immediate comment on the number of casualties or the effect on production. The plant exported 2.3 million tons of fuel oil in 2013, of which 1.8 million tons were shipped via the Black Sea ports of Tuapse and Taman. Around 400,000 tons were shipped via the Pacific Ocean. It also exported 220,000 tons of diesel and 200,000 of straight-run gasoline from the Far East last year. The plant had been shut down on May 11 for regular maintenance, and its planned restart had been brought forward from June 19 to June 12-16, the energy ministry said.